Variac model TDGC2-2 is an energy saving voltage regulator with no waveform distortion that can be used with an electric coffee roaster to stablilize the voltage being delivered. Rated at 110V input with an output voltage of 0-130V. Maximum output current is 20A with a capacity (KVA) of 2.0. The front of the unit has two receptacles, a voltage meter, fuse and on/off switch. The desired voltage can be set between 0 and 130 volts using the large dial on top It is rated for 2000 watts, ample for most home roasters. Please note these units are very heavy, weighing in at about 25 pounds in a unit the size of an 8 inch cube. While very easy to figure out, this unit does not come with instructions. 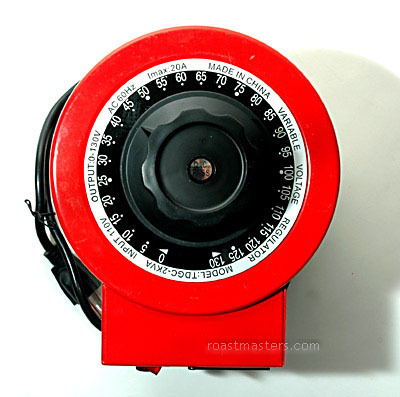 Also, if used to adjust roast profiles, use of the Variac may void your home roaster's warranty.